Bronwen Mills studied at the Guildhall of Music after obtaining a Bachelor of Music degree from King’s College, London. She began her singing career with John Eliot Gardiner’s Monteverdi Choir, singing also for the Schutz Choir with Roger Norrington, The Richard Hickox Singers and the BBC Singers ad hoc. She made her operatic debut with Kent Opera singing Miss Jessel in Britten’s The Turn of the Screw. She then sang Fiordiligi in Così Fan Tutte and Violetta in La Traviata for Opera 80 (now English Touring Opera), to great critical acclaim. She has sung principal roles for Welsh National Opera, Opera North, Dublin Opera, New Israeli Opera, and in Parma, Ferrara, and Reggio Emilia in Italy. She has wide concert and oratorio repertoire and has sung with the English Chamber Orchestra, the Scottish Chamber Orchestra and the Halle Orchestra as well as making regular appearances on the South Bank in London. She has been the soprano soloist with most of the major choral societies in the UK. She sang Handel’s Messiah in Lithuania and at the Kremlin in Moscow conducted by Yehudi Menuhin. She has made recordings including Donizetti’s Emilia di Liverpool, Boyce’s Solomon, Dibdin’s Ephesian Matron and Polly in The Beggar’s Opera. She is regularly to be heard on Radio 3 and Classic FM. Bronwen is the singing teacher of the choristers at Tewkesbury Abbey. 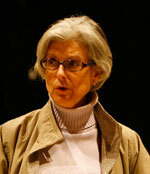 She is also singing teacher at Lincoln College, Oxford and teaches the Choral Scholars at many other Oxford Colleges.